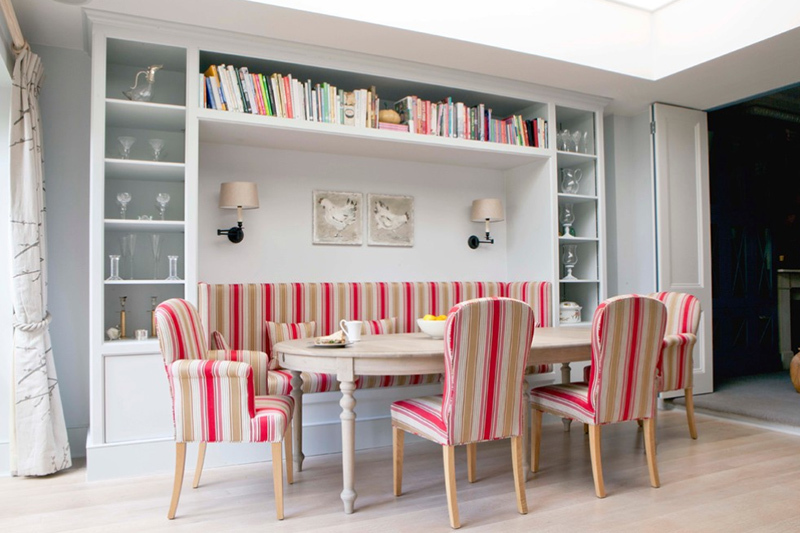 Perk up your dining rooms with these wonderfully upholstered chairs! I know what you’re thinking. 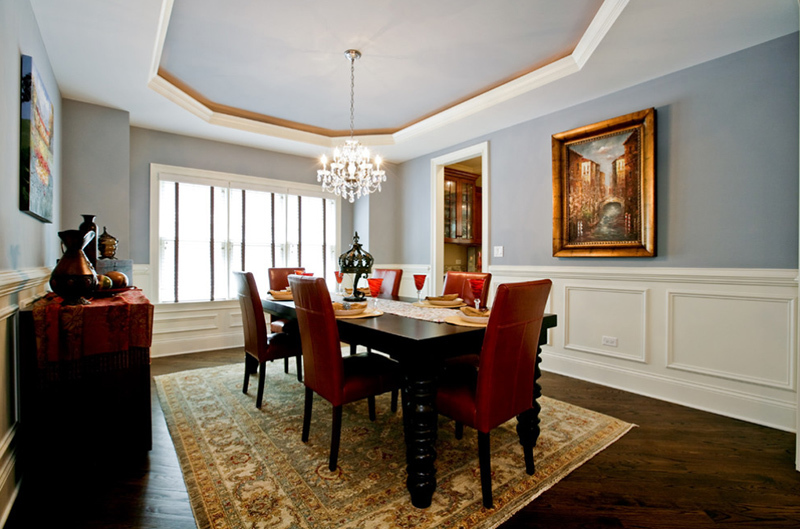 Upholstered chairs are usually a choice done when picking furniture for the living room, but dining rooms? It might be another expense if you consider getting upholstered dining chairs but if you actually have an extra budget for them, I think you’ll have a far more comfortable seating in your dining space which you and your family would love. Let’s take a closer look at the pictures that we have prepared for you guys so that you can see for yourself – the beautiful dining sets we have in here. The dining areas that we will feature today has upholstered dining chairs that somehow complement the room or stands out entirely! There are some chairs in here that might actually catch your attention and the attention of your guests every time they visit your place for brunch or dinner. Ready? 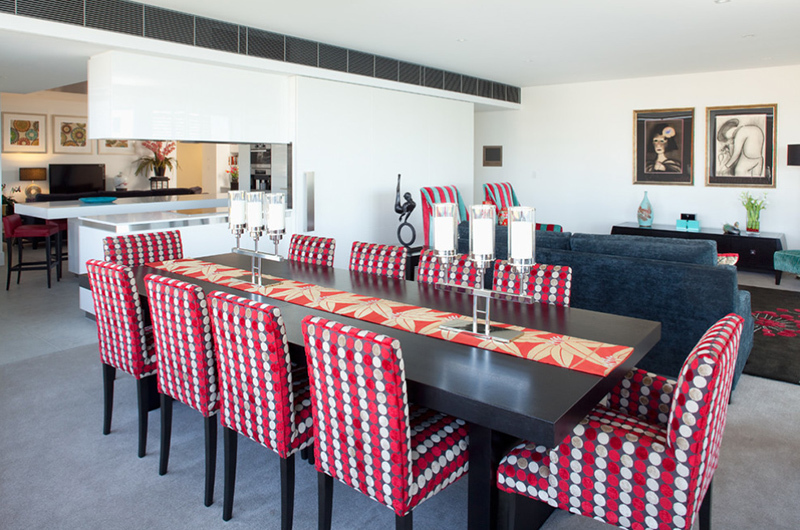 Here are the following pictures of the lovely dining rooms with their beautiful upholstered chairs! The masculine design of these dining room chairs is exactly what this room needs to spice up the white walls and flooring. A hint of colors spread here and there made this room looking splendid and quite a bit fancy. This sure looks what a Napoleon home should look like. The color palette is remarkably homey and clean, something we all need for our homes. Even the decorations or accents are earth-tones – I love it! This home has its way with colorful fabrics for their chairs – even note that the high back chairs by the living area is colorful too! These are statement pieces people would love to see every now and then. 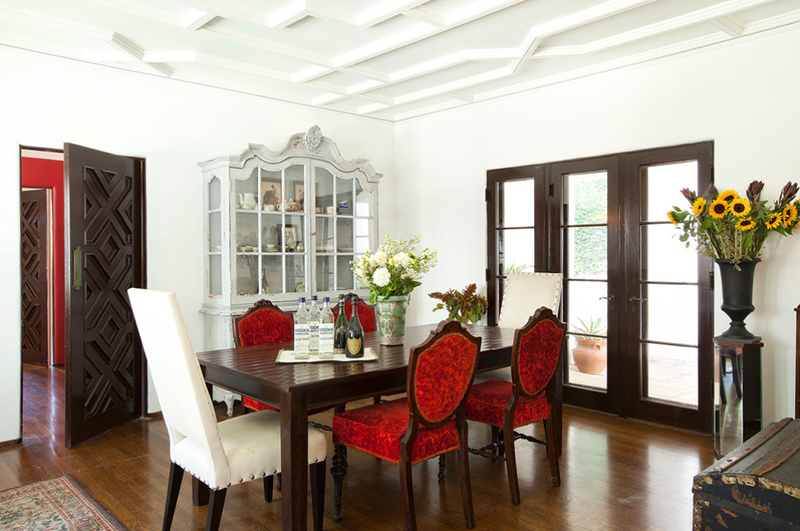 This wonderful dining space is just so pleasing-dining in it is a plus. That’s the thing about beautiful spaces, sometimes it gets too awkward to move around it because of how pretty it is. 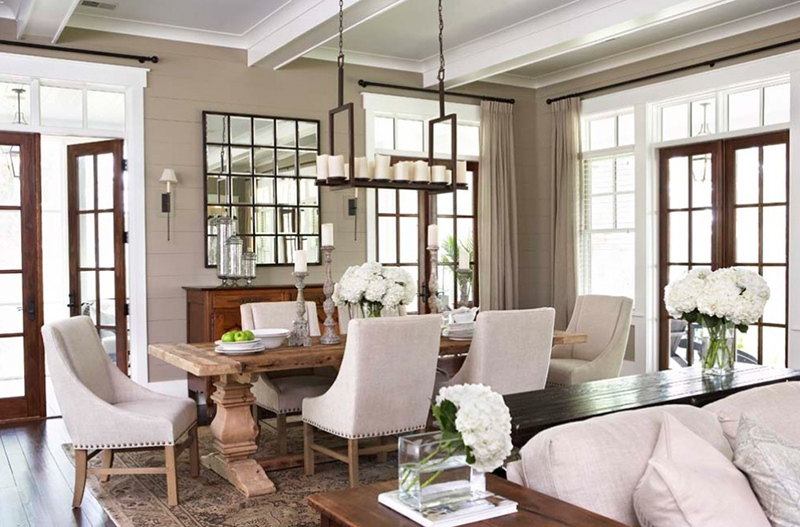 This maybe one of my favorite spaces in this list because of the beautiful dining chairs that this set has. It matches with the lighting fixtures in the room too! At first look at these chairs, and you know that they are really comfortable! The classic look of these chairs will go well with either a wooden table or a glass table. 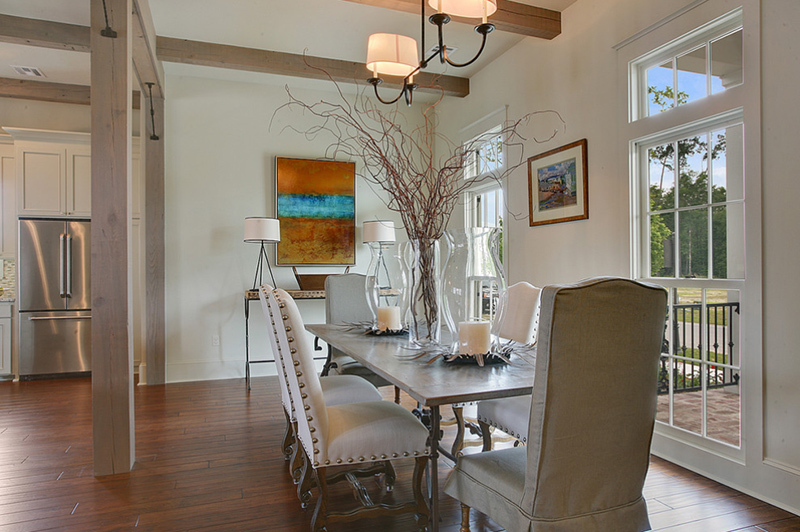 It sure is eye catching and perfect for this dining space. Comfortable seating is always a good thing especially when you are staying in that particular space to rest. We do not necessarily rest in our dining rooms but having comfy chairs will definitely help when you are with your family – having dinner and chatting. What do you think about the print on these dining chairs? It is pretty unique and eye-catching. It matches with the wooden table in the center of the room and even the flooring and the buffet table. The contrast with the carpets make this space quite alluring. 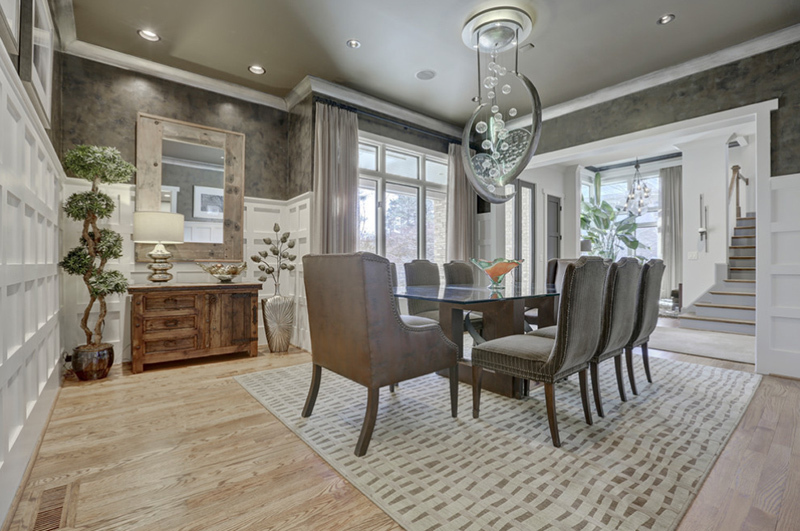 Beige upholstered chairs paired with a wooden rectangular dining table looks absolutely divine! The airiness of this home makes it really inviting and refreshing to actually hang out in here and have your afternoon tea or drinks! With this Putney house, you will surely have an interesting dining experience especially if you visit it for the first time. The summer look and feel of the fabric on the seating is just nice to look at and really creative for the soul. Talk about contrast with the furniture and the wall display area. 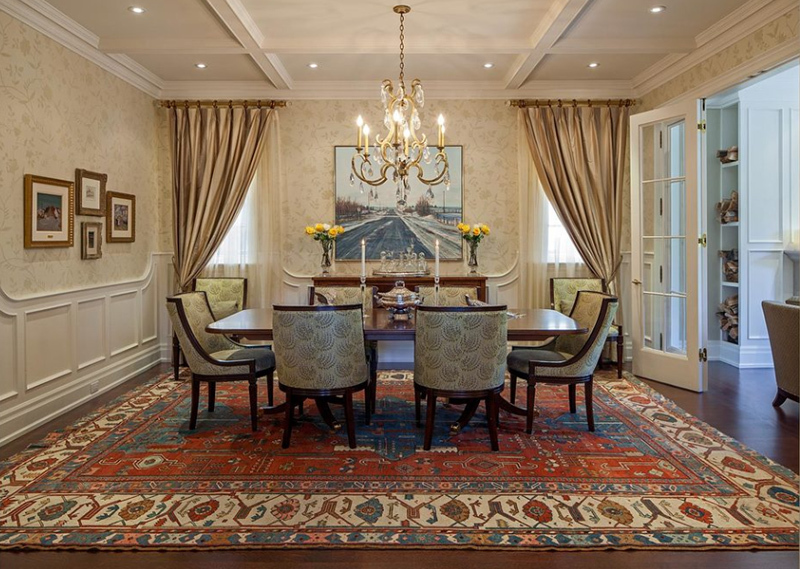 This dining room is so regal, I think there are no kids living in this house. 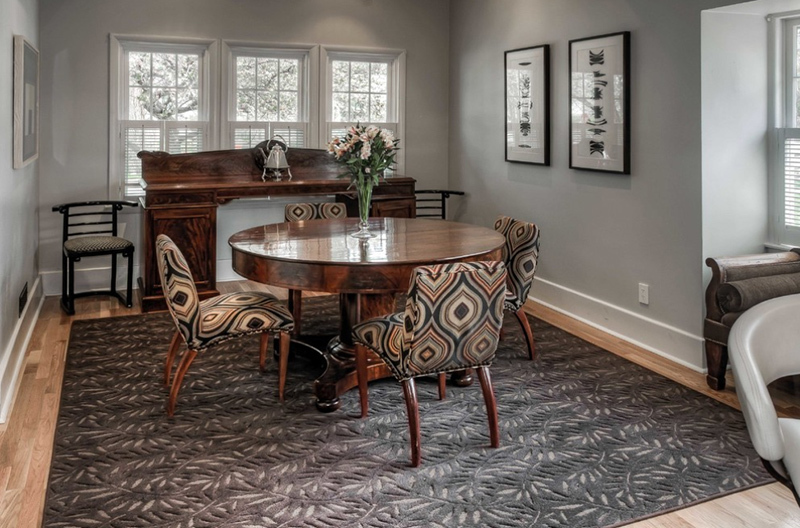 This Lafayette home has a beautiful take on the saying, eating with your eyes makes all the difference. Living in this house would mean having to feast with real food and the space itself. The chairs paired with the black dining table sure match well with the couch by the living room. This entire room is classy and neat, fancy yet simple all at the same time. 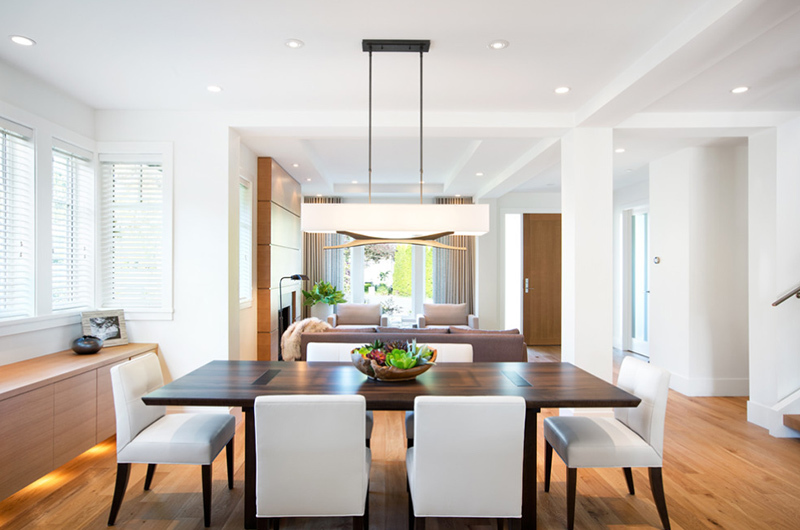 The additional lighting fixture above the table is a nice touch! This dining room set up sure looks like something you will see in a Chinese movie. 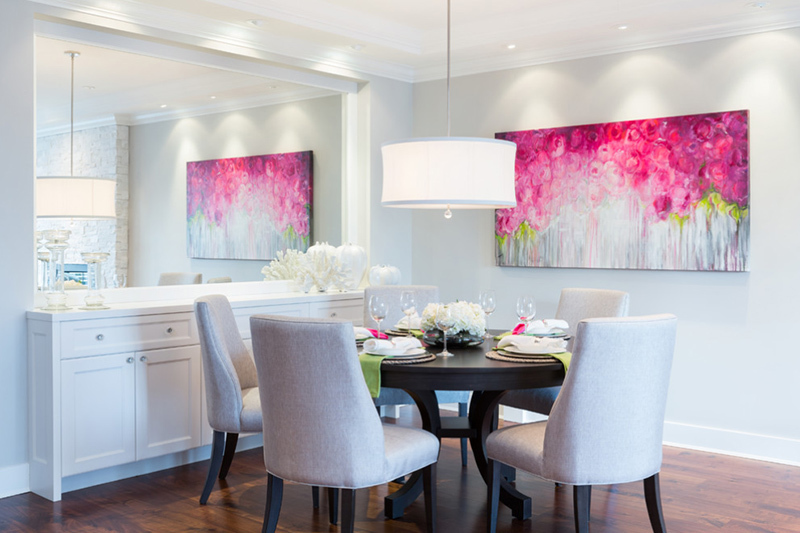 The colors, materials, furniture and decors in this dining area is extremely classy and fancy all at the same time – I love it! 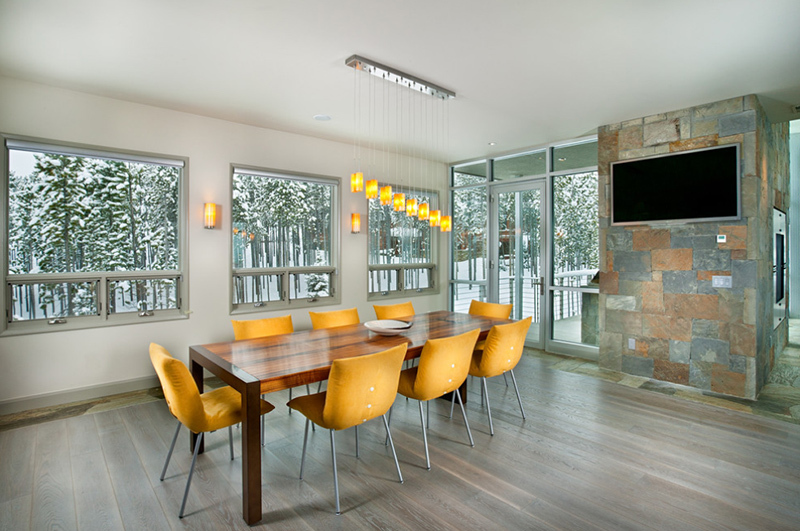 When I saw this dining room, I thought to myself that this sure is a beautiful space to be in – the house looks well made, the windows gives this place great lighting and ventilation and you and I could guess that the seeing the outdoors is a good thing. The red chairs in this dining set is adorable. I do not like the white chairs but I think that they match with the red chairs perfectly! Seeing that these chairs are the conversation starters in this space, I think the owners chose wisely. 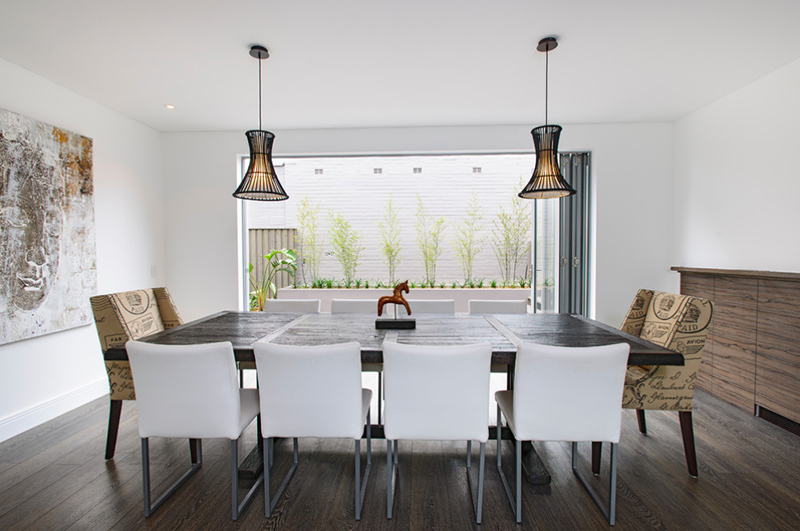 I would assume that these chairs are made from faux leather and looks great for this dining space. From the colors of the walls and ceiling to the decorations added to this space, you can tell that this dining set looks totally in place. Now, this house looks incredible! We obviously see only a portion of the house, but you know that this place is an immaculate beauty. Their first choice is white and their choice of upholstered dining room chairs sure suits and match with the entire space. This is one adorable dining room set! It seats upto ten people and I think it makes it a great space for conversation, chat and hanging out. The furniture choice is great and the decoration on the wall and on the table itself is simple but interesting. 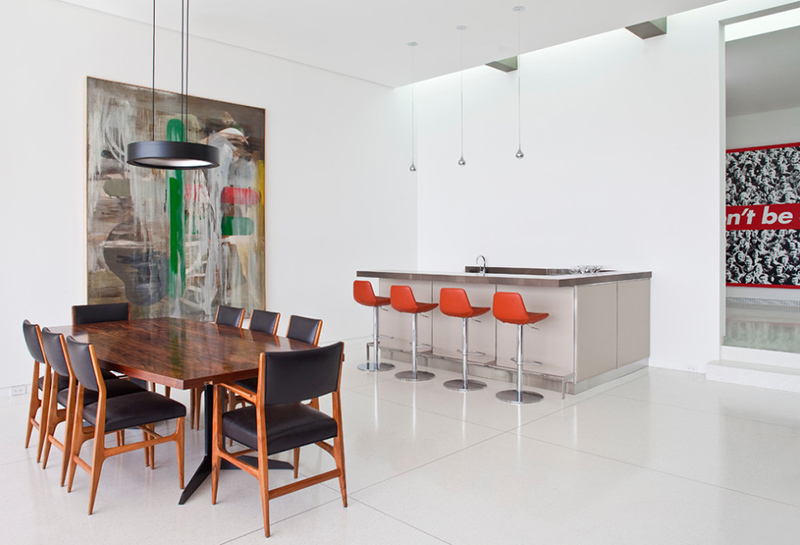 AMW Design Studio designed a nice dining space in this beautiful Lake Road residence. The neutral shade of these chairs are enough to actually match with the color of the walls and the flooring. 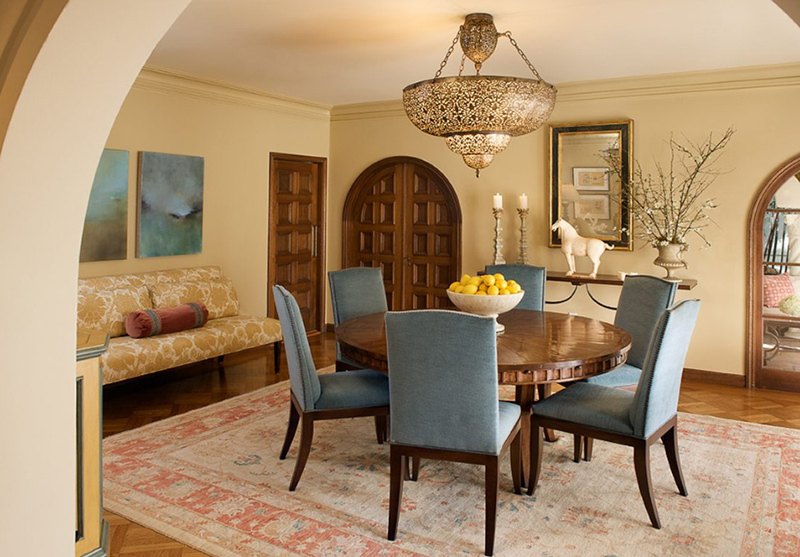 Look at the lighting fixture in the middle of the room – doesn’t it look romantic and pretty? It seems like to half moons holding round stars in the center. It’s also nice that the interiors have plants, whether real plants or just decorative. I have always wanted comfy seating for my living room and bedrooms at home, but seeing this list, I now know that I’d be getting upholstered chairs for my dining set as well. For more inspiration, you can check out the 22 Contemporary Upholstered Chairs in the Living Room which is a totally different thing but might just stir your imagination and tweak your living room ideas!